In New York, I had a friend named Mike. He was a larger-than-life character with wildly improbable stories to tell. Some of them were even true. One weekend, he spontaneously decided we should fire up his Honda Gold Wing and tour the diners of New England. So we did. A required early stop on our way to Vermont was the Miss Worcester Diner in Massachusetts. This claustrophobic classic was built in 1948 by the Worcester Lunch Car Company and added to the National Register of Historic Places in 2003. In other words, diner Mecca. I love diner style and, more often than not, their generous portions of well-prepared American classics. 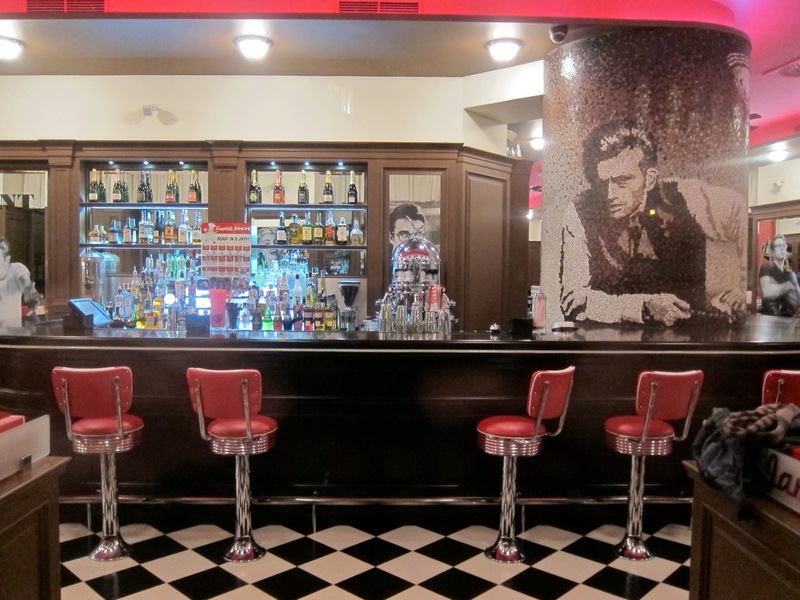 So when I saw the diner-themed James Dean restaurant opened up earlier this month near Old Town Square, I was eager to try it out. 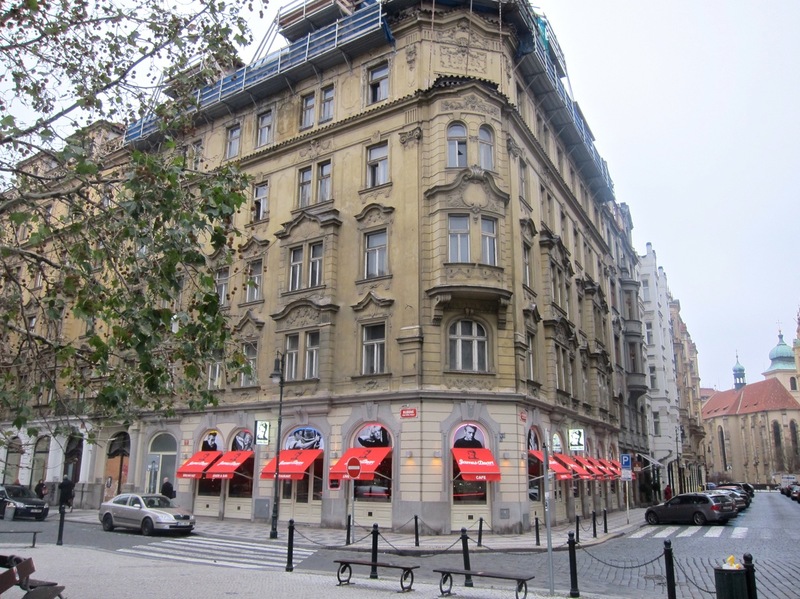 The central, high-traffic location has had lots of tenants over the years, most recently the Russian-oriented Fragola Project restaurant and club. 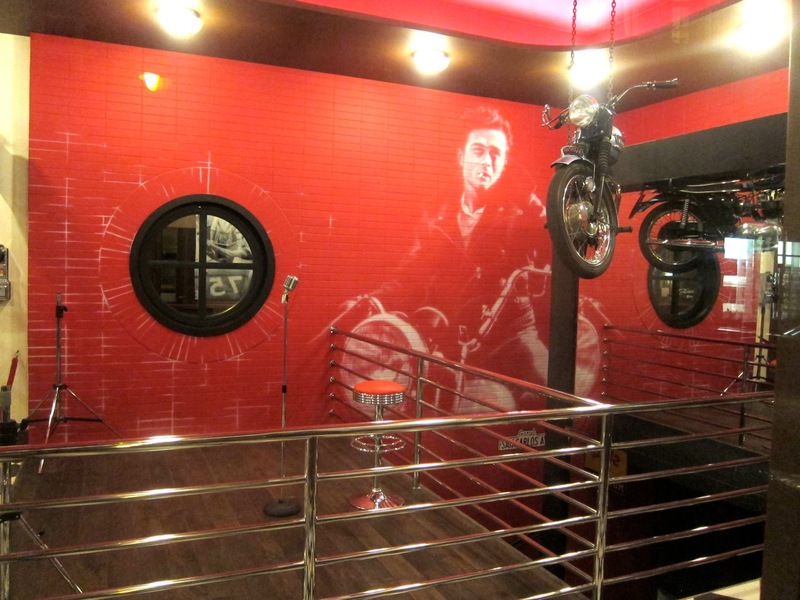 Like James Dean himself, the restaurant is eye-catching. The booths and big cushy chairs are wrapped in bright red and white vinyl. The walls are decorated with air-brushed images and mosaics of both James Dean and Marilyn Monroe. They're a couple, it seems. Marilyn gets equal wall space if not equal billing. In other words, diner Disneyland. But it's not just for kids. A cocktail bar serves drinks ranging from a Cosmopolitan (120 CZK) to a James Dean (170 CZK), which is Russian Standard vodka, Bols Peach Liqueur, lime juice, banana juice, blueberry purée, and fresh orange juice. I'd rather have a Gimlet (105 CZK). A motorcycle hangs from the ceiling. There's a jukebox near the front door. I didn't see it working, but the sound system plays 1950s classics like "Teen Angel," "Chantilly Lace" and, unfortunately, Alvin and the Chipmunks. I actually thought that most of the time, the music wasn't loud enough. It was often drowned out by the din of customers' voices. On almost every visit, the place was full. That includes weekday and weekend nights. The seats at the bar were always taken, often by good-looking women. James Dean takes reservations, and many booths were booked ahead. It seemed like the place to be for the moment and they were turning people away. Not only was it crowded, it was smoky. Smoking was allowed in most of the restaurant. There was a small non-smoking section, but it was not separated from the smoking section. It was not pleasant for this non-smoker. On my first visit, I scored a small booth and ordered the bacon cheddar burger (195 CZK) along with a chocolate shake (80 CZK). The waitress looked at me like I was crazy. "Those don't go together," she said, making a funny face. "It's a pretty common combination in America," I replied. "Oh, I see," she smiled, seeming like she had learned something. "OK!" This burger could have been great. The toasted bun was crispy and light, but sturdy. The bacon was perfectly cooked, smoky and really the best I've had on a burger in Prague. The real cheddar was nicely melted and top quality. The thin-cut red onion and tomato were fine. The red and green lettuce was not classic and not to my liking, but that was not the main problem for me. By my standards, the meat was all wrong. The menu says "200 grams ground beef burger." This is not right. There was pork in there. There's a school of thought that says beef/pork mixes are OK. I say it's not OK. I'm a 100% ground beef person. Just add salt. 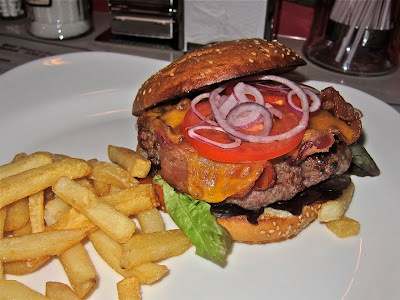 Whether it was the pork or a lower quality of beef, the texture of the patty was too dense and rubbery. It didn't necessarily taste bad, just wrong. The James Dean bacon cheddar burger came with fries, but I was told later by a friend that fries would no longer be included. Either way, they were very greasy and not very many. The chocolate shake was one of the worst I've had in Prague. It was thin and milky, with not enough ice cream. The beverage was super-sweet, but there was almost no chocolate flavor at all. 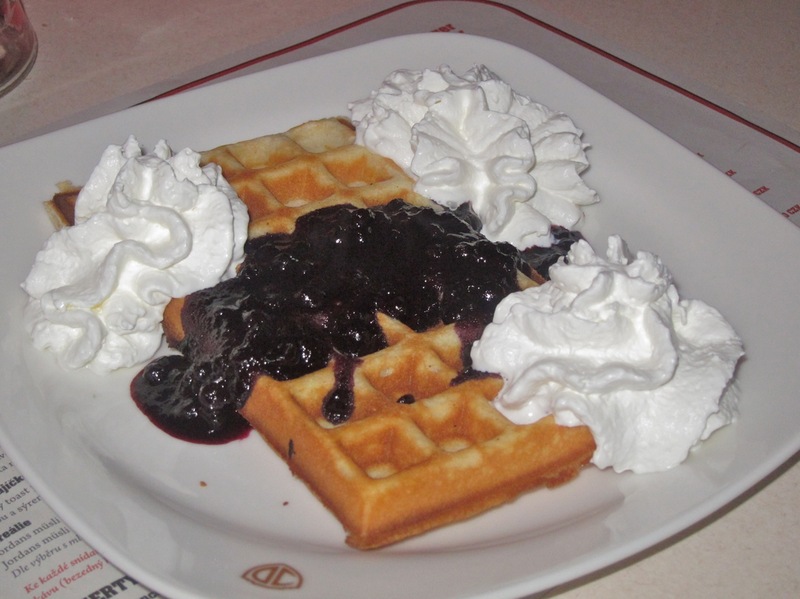 Despite the caloric H-bomb I'd just consumed, I had room for one more thing: the blueberry waffle (95 CZK). This is available for breakfast and doubles as a dessert. The waffle, made with a relatively sweet batter, was hot, crisp and enjoyable. The blueberries from a jar and the whipped cream from a can were not so enjoyable. The visit set me back 370 CZK. James Dean does breakfast, which any self-respecting diner would do. It is served from 9 a.m. until noon. I got there right after opening and within an hour, the place was filling up. I started with fresh-squeezed orange juice. 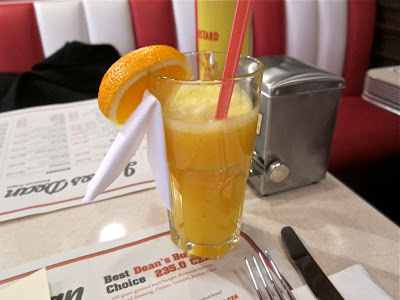 It was lightly sweet and tasted fine, but I prefer juice chilled. This was room temperature. 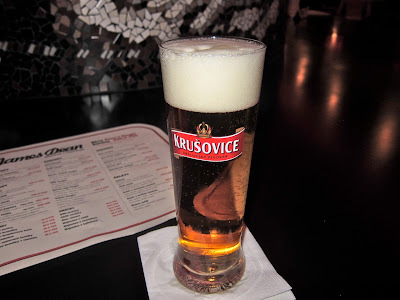 On the menu, the price was listed as 33 CZK for .1 liter. They don't tell you that the juice is served in a .2 liter glass and you will be charged 66 CZK. In other words, diners beware. 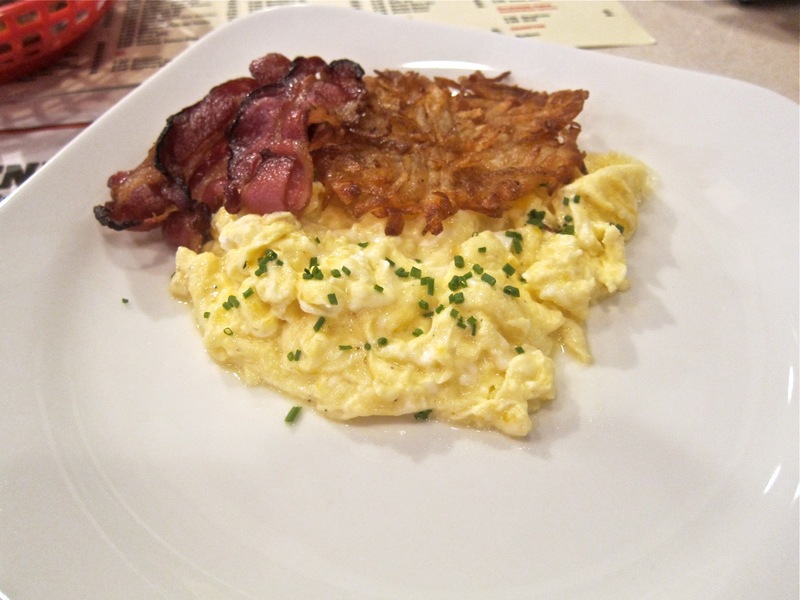 I had three scrambled eggs (85 CZK), bacon (35 CZK), and hash brown (20 CZK). The eggs were cooked on the loose side and needed a shot of salt. I prefer them more firm, but that's just my personal taste. The disappointing hash brown was crispy but small and razor thin. The bacon was the highlight -- as lovely as it was on the burger. 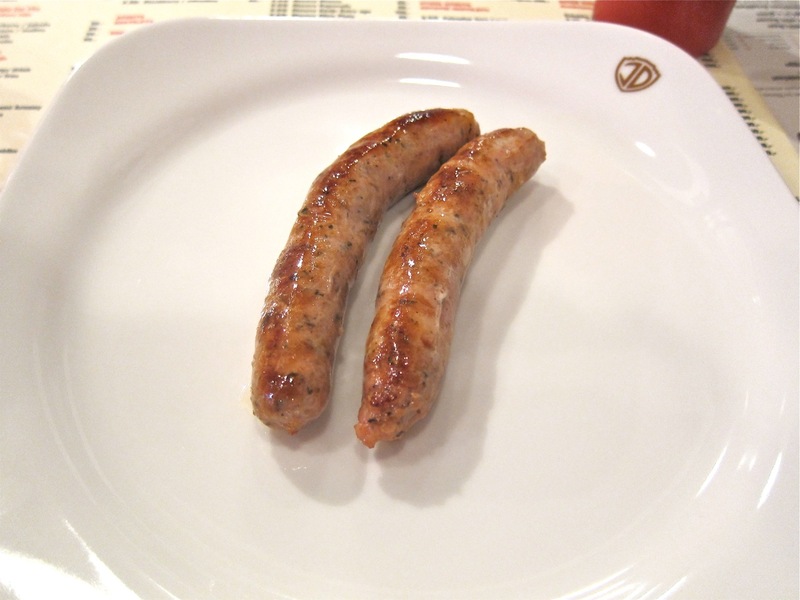 I also got an order of sausage (35 CZK), which came out later. They were meaty, mixed with herbs and spices, but they didn't taste particularly American or even British. 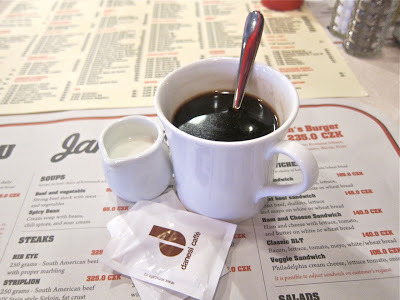 The breakfast came with free bread and a bottomless cup of American coffee. This is certainly an eye-opener for Prague. I hate to look a gift mug in the mouth, but it was rather bitter and it came with a tiny pitcher of milk. I needed more. This morning meal, which I did not find very substantial, cost me 241 CZK. It's a better deal to order the slightly smaller American breakfast for 160 CZK. I went back for more evening fare. I sat at the bar and had a beer, a .4 liter glass of Krušovice (55 CZK). Not a good brand and not a good price. 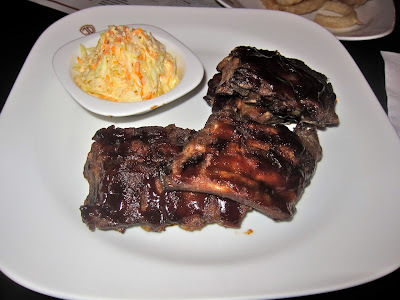 I had the 400 gram portion of pork ribs baked in black beer and chili sauce (185 CZK). These were pretty good. There was very little fat. The meat was tender and pulled easily off the bones. There was some dryness around the edges. The sauce was good. It was homemade and not from a bottle. I got a side order of coleslaw (40 CZK). I often think American-style slaw is too sweet. This version wasn't. Instead, I found it oddly salty. 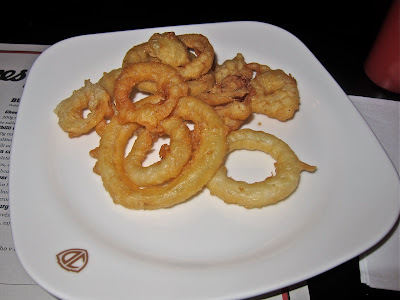 I also had their onion rings (35 CZK). The thick loops of onion had a tempura-like batter. They were super-greasy, under-fried, and bland. Their chicken wings were offered either baked or fried. I asked for a fried order of eight (155 CZK). They came with a light coating of barbecue sauce. Hot wing sauce was not offered. The meat was fresh, tasty and tender. But they didn't taste like classic fried wings to me. There was no crispness. They were almost too soft. Strangely, when I asked for some extra barbecue sauce, I was given a plastic squeeze bottle of run-of-the-mill bottled sauce. 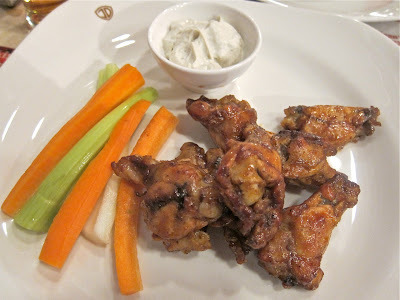 The wings came with the requisite raw carrots, celery, and an extra thick, very blue cheesy dip. 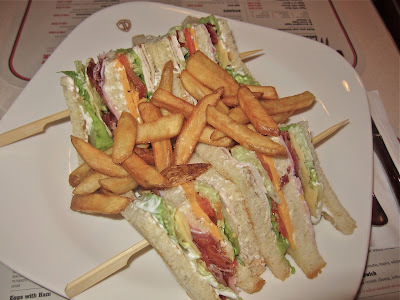 Looking for something to love, I went again and tried their club sandwich (195 CZK). This was closer to what I was hoping for. It's turkey, ham, bacon, lettuce, tomato, cheddar, Swiss cheese, and mayo on white toast. I question the need for two cheeses, but it was a big meal with fries and it was my favorite item on the menu.. I also had a glass of the homemade mint iced tea (55 CZK). 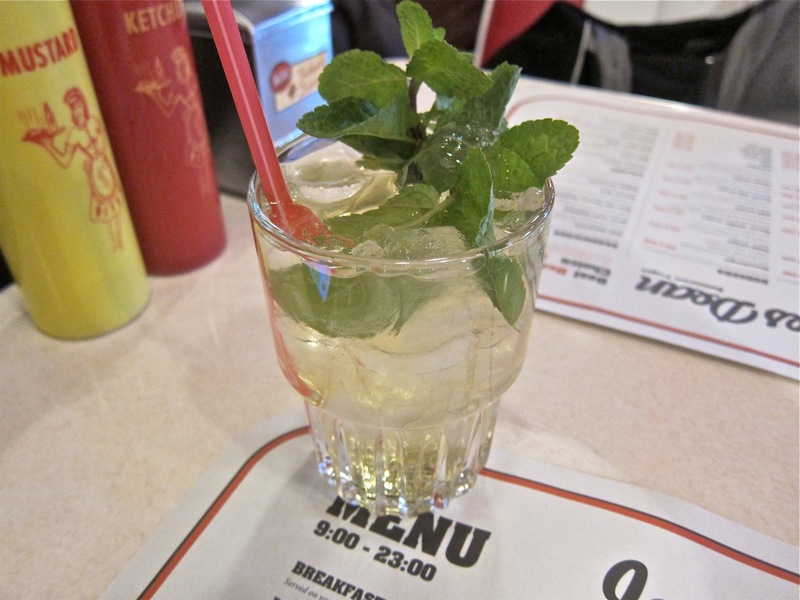 I only tasted a little mint and little else. It was disappointing for the price. 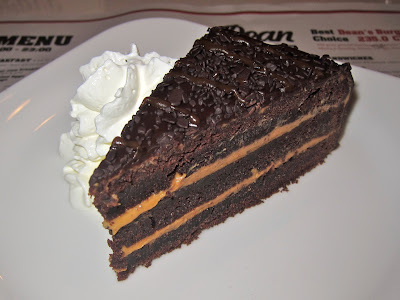 Finally, I had a chocolate cake for dessert. The slice was dense and fudgy, with a caramel-like filling between the layers. I don't know who made it, but I liked it. 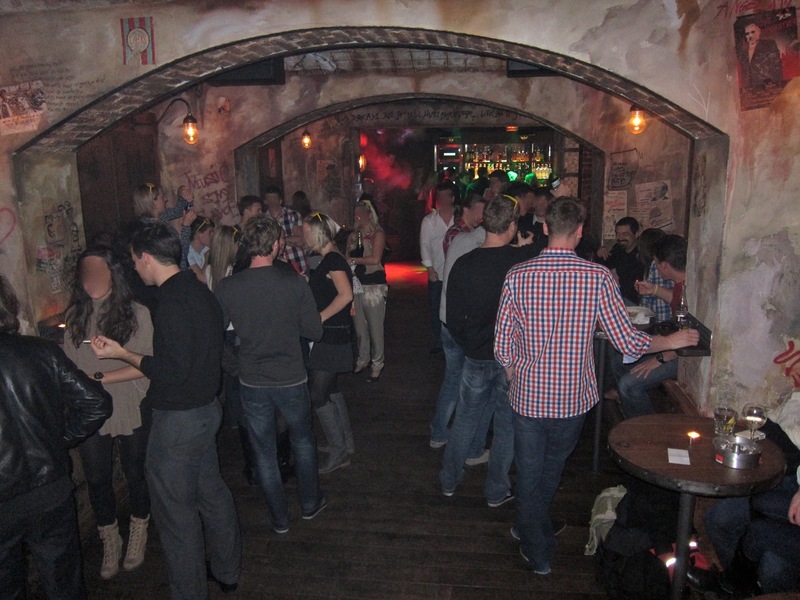 One way to burn off all the calories is to hit the dance club downstairs. I thought they might go with a 1950s theme, but they went a different way completely. 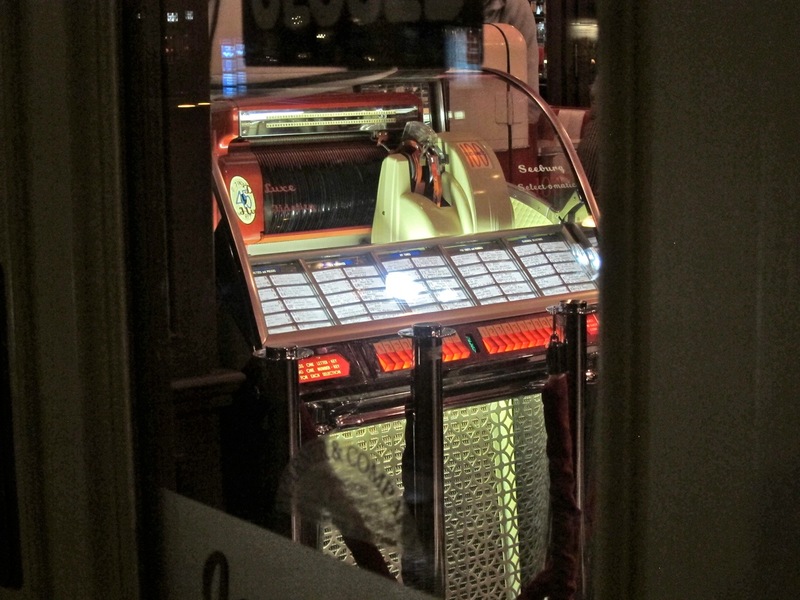 The club, which plays a lot of later rock classics, is an almost exact faux grunge copy of Harley's Bar, which is just a few steps down the road. There were a few differences. 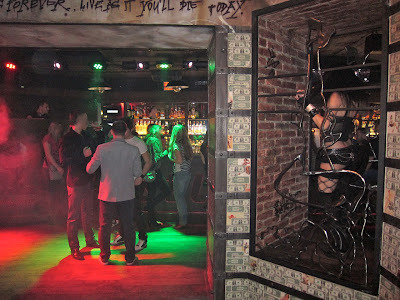 James Dean has $1 bills papering the wall and a scantily clad cage dancer. It was too early to tell if the place will also have Harley's licentious bartenders and free-wheeling, drunken dancing on the tables ethos. Overall, James Dean doesn't win any awards in my book. I've heard there is at least one American involved, but it seems to me that a decision was made to cater to Czech or non-American tastes. Who am I to argue? The early heavy traffic indicates the style and perhaps the substance were pulling people in. Maybe the short, electric blue and pink 1950s style dresses worn by the waitresses also help. I just hope the service improves after the many hiccups I experienced in their first weeks. I went for five solo visits, but I'm not in a big hurry to go back. If I crave American-style burgers, ribs, and shakes, I'd rather go to the Hard Rock Cafe or even TGI Friday's. If I want a real American breakfast, I'll go to Bohemia Bagel in Holešovice. Like them or not, they all do a better job with the food. 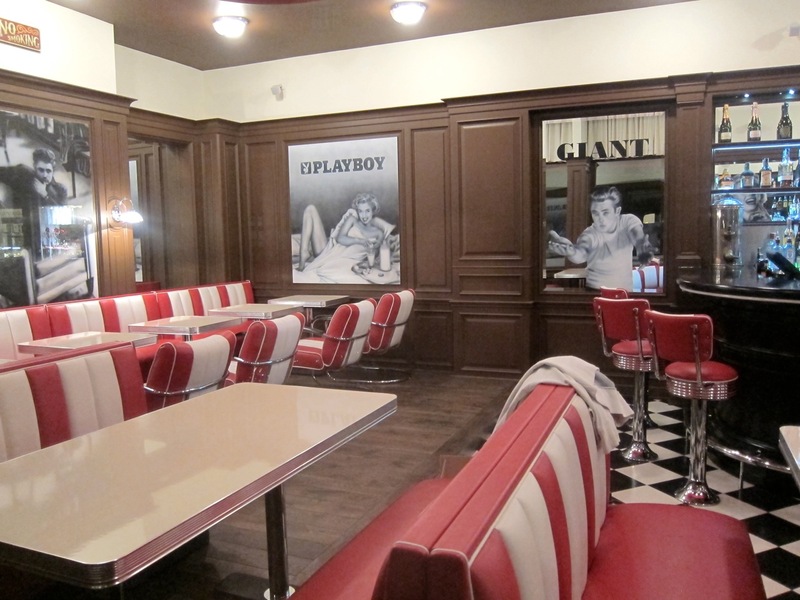 Naming a restaurant after a Hollywood icon and plastering it with his photos immediately communicates what the place wants to be. I just think, given the quality of the food, it would more fitting if they called it John Travolta. 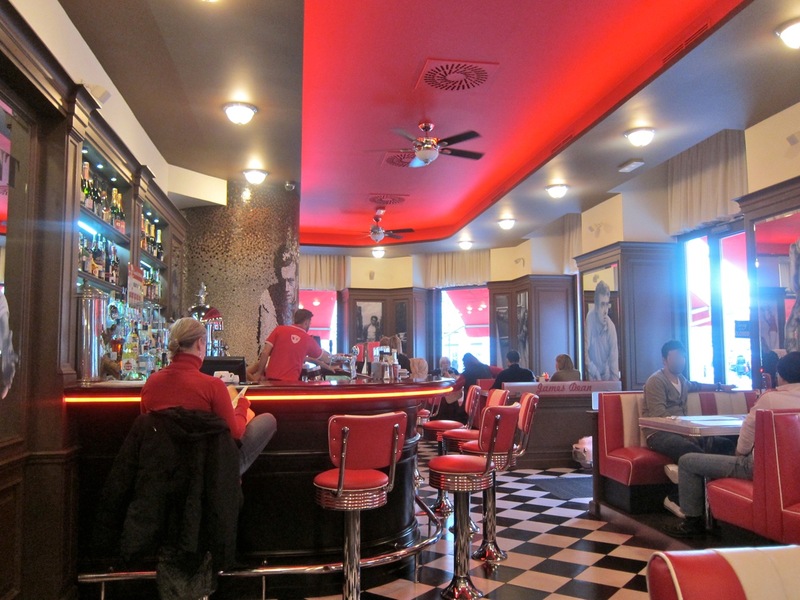 Enjoyed your very detailed review of this american diner in Prague! I only hope the lovely Old Town will not be taken over by more of these sanitised versions of diners.Keep it Czech I say! Indeed :) But well, if you would introduce a standard time (like 30 seconds after delivery) and take close up pictures (video even better), there would be some way of telling how sparkly/fresh or flat the beer might be. Still cant show the taste, of course..
as a restaurant owner i wonder how these people make any money....??? or is this another laundromat... i feel paranoia like mel gibson on that pelican brief movie ? what's it called, w julia roberts i think... anyways, nowadays when i see these poor presentations of food (not even gonna talk about the prices) and the high rent price tehy must be paying.. i end up with the same conclusion.. or is it just me? 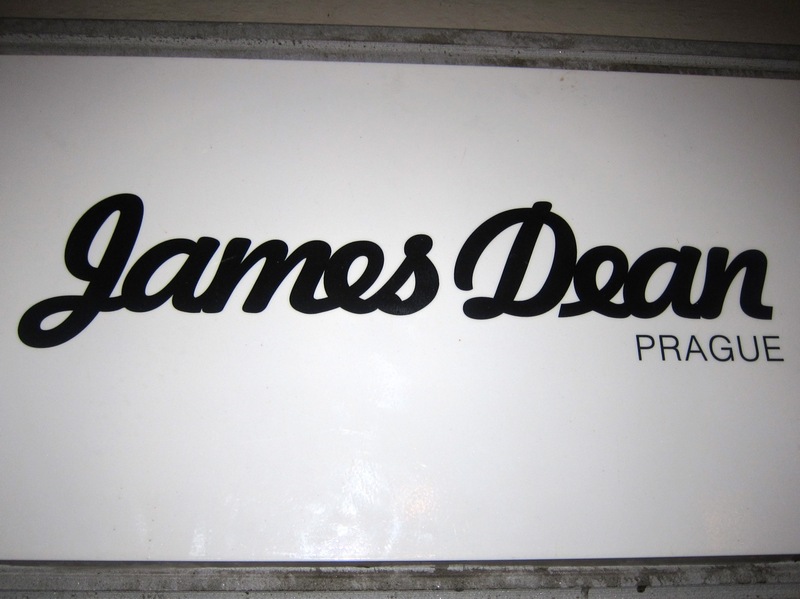 I visited Prague in July 2013 on a tour of Europe and was totally unaware of the James Dean restaurant until my friends, knowing how much I love James Dean, excitedly came over and told me. 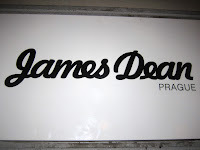 We went in, and I was pretty in love from first sight of all the James Dean related items... not gonna lie, I still have a napkin with his signature printed on to it that I got from here. 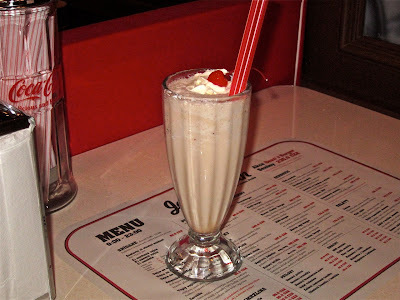 We only had time to get a drink, so I ordered a chocolate shake and sat at the bar. I can't remember exact details but it definitely wasn't bad, so perhaps they changed their recipe/staff since you visited? Anyway, thanks for the review I only wish I had seen this a year ago and been able to try out some food items for myself!